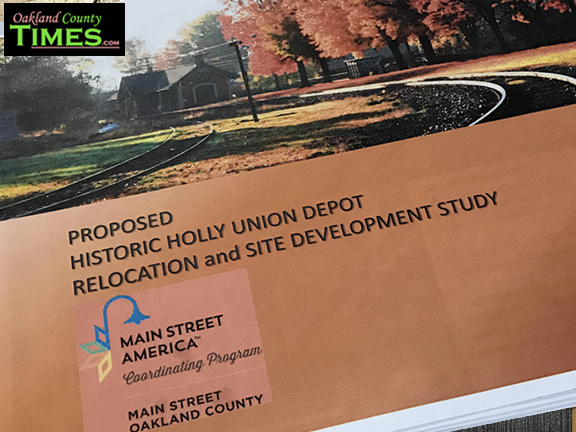 Holly, MI- “We can only look at our beautiful building from afar,” said Village of Holly Assistant Manager and DDA Director Katy Hughes as she explained the desire behind the community’s effort to move the 1886-built Holly Union Depot to a place where it’s safe for the public to access. 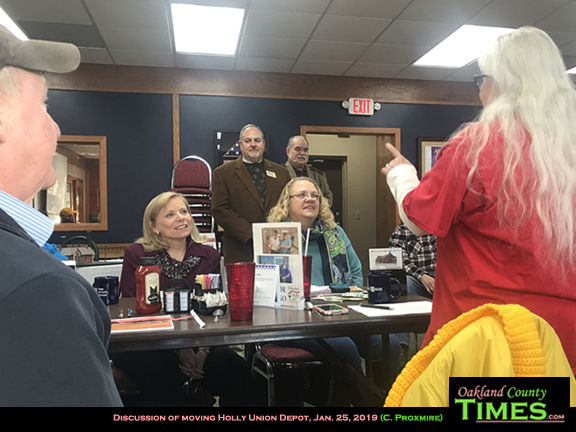 Hughes spoke to Holly Area Chamber of Commerce members and guests as part of the Chamber’s monthly breakfast meeting on Jan. 25. In the 1990s, the Village was able to buy the building for $1.00, but the land remained railroad property. Since that time, railway safety rules have changed, so Village officials and residents are unable to access the building without it being considered trespassing. In order to be of use, the building must be moved to a safe distance from the tracks. The hope is to move it closer to downtown, in the area of green space across from the Holly Hotel, Moose Lodge, and Andy’s Place. 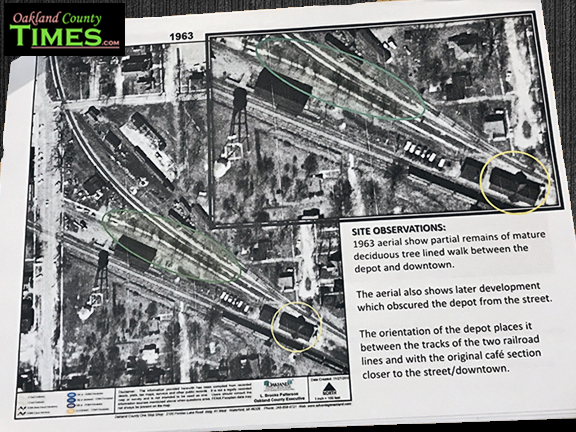 The move would be about 1,000 feet and would actually make it closer to the location of the first depot that had been built at the junction. “Both railroad companies have agreed to sell the pieces of property that we want to buy. It is our hope that they will donate the property to our 501c3, but we’re still working on trying to make that happen. I’ve been communicating with real estate specialists for both CN and CSX. Thankfully, they are supportive of our endeavor,” Hughes said in a follow-up interview about the proposed move. The biggest challenge, of course, is financial. Grant proposals previously written give estimates of up to $550,000 to purchase the property, have the building professionally relocated, and to restore it to a point of being safe for public use. There is currently about $22,000 in trust that was raised in the late 1990s for upkeep and preservation that can be used towards the move. The rest will need to come from fundraising or grants. 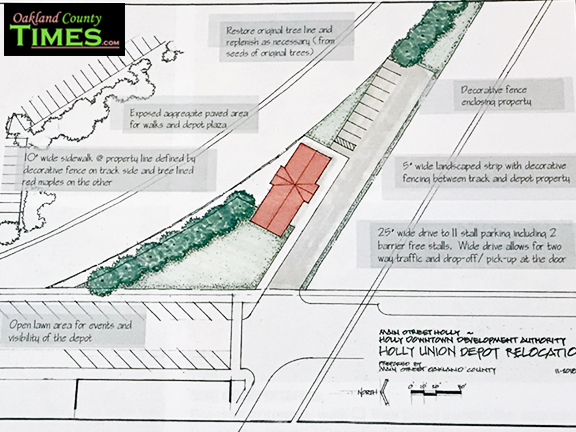 The property under consideration has an assessed value of $15,680 according to a report done by Main Street Oakland County about the potential for a move. Several volunteers have already stepped up to help with fundraising, including an anonymous donor who purchased 40 locking donation boxes to go in area businesses. 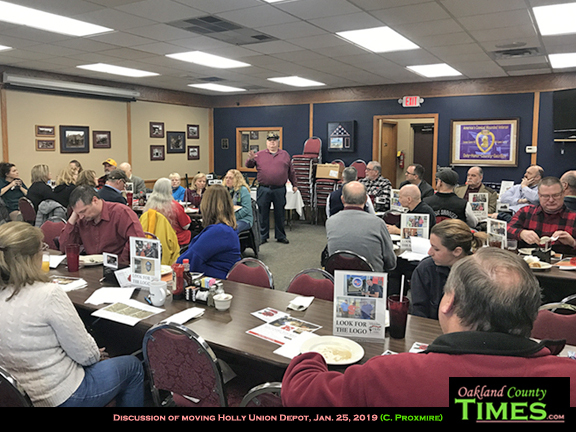 Community members have been contacting businesses asking for donations Even spreading the word about the project is helpful to prevent misinformation and to get people excited about it, Hughes said. “We want to have a clear message about what is happening, and stop rumors,” she said. The other key point of discussion is of what to do with the depot once it’s moved. In some communities depots have been restored and turned into businesses, welcome centers, coffee shops, or municipal offices. 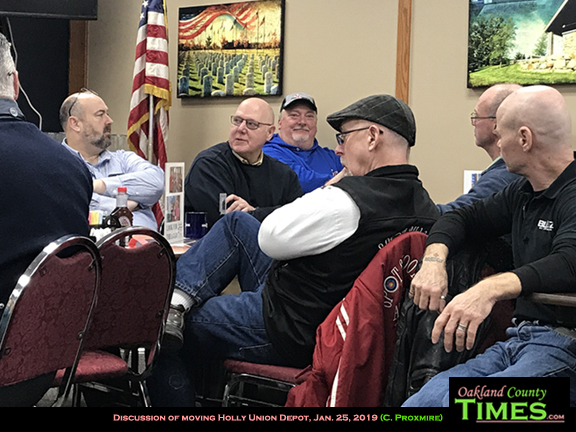 In Holly, community discussion is in the early stages, with many possibilities being considered. 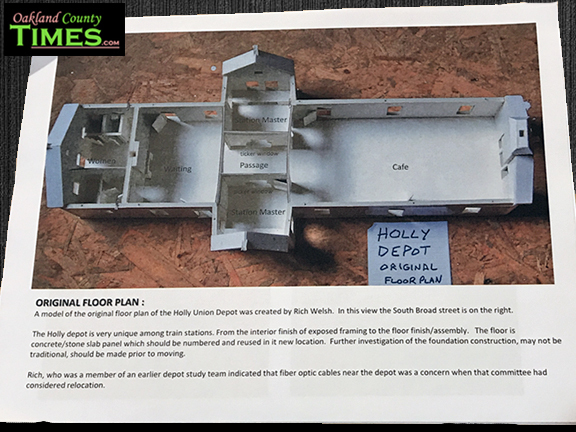 Whatever purpose the building takes on, it will undoubtedly be a place where visitors can learn about the depot’s – and the Holly community’s – history. 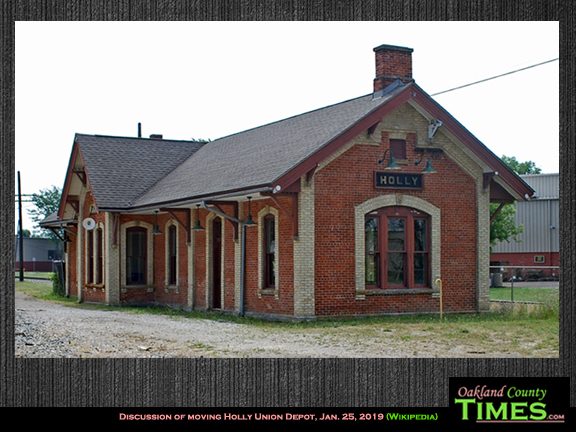 The Holly Union Depot is on the National Registry of Historic Places, and it’s been a landmark for the community since it was built in 1886. Joe Mishler of the Holly Area Veteran’s Resource Center presented information about the depot’s history. “The first railroad junction in the state was in Holly,” Mishler said. On Nov. 1, 1864 the Flint-Holly Railroad crossed the Detroit-Milwaukee railroad that had already been established in 1855. This was the first diamond in the state. The 1886-built depot now on the site is the third depot in the area. The one before it burned to the ground, with neighbors cheering on the demise of what was dubbed “old mossback” because of the sagging, moss-covered roof. In 1862 the area that is now Crapo Park was the site of a giant picnic. One thousand Union troops from Michigan’s 10th Infantry passed through Holly on their march from Flint to Nashville. Holly residents built picnic tables out of lumber donated by lumber baron (and future Governor) Henry Crapo, and served them with the best hospitality they could muster. More recently, current residents can remember using trains to travel near and far. Village Council President Tom McKenney used to pay $5 take the train between his family home in Holly and college in South Bend, Indiana. Before that, in the 40s and 50s, teens would jump on freight trains illegally and ride down to the Walled Lake Amusement Park, hopping another train to return. In addition to the memories shared by residents, the building itself has stories to tell. The depot has a “floating floor,” meaning that the stones are not connected in a foundation but simply pieced together like a puzzle. To preserve this, each piece would need to be numbered and the process well- documented so it could be placed in the same way in the new location. Among those stones is one that is clearly worn down from the years of attendants manning the ticket booth. “We are so lucky there is this group of people who love our history, and have said ‘let’s not talk about this anymore. Let’s make it happen’,” Hughes said. 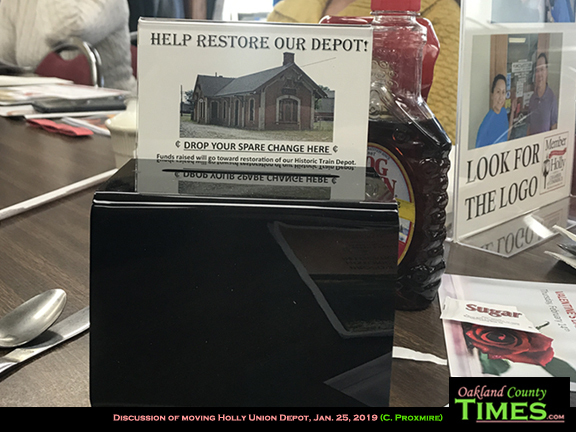 Those who want to support the efforts to move the depot can put money in the donation jars at Downtown Holly businesses, or they can send a check to Main Street Holly, 300 East Street, Holly, MI 48442.